Jane Monday, former Huntsville mayor and member of the Texas State University System Board of Regents, will discuss “From Wife and Mother to Mayor to The Texas State Board of Regents” on Monday (March 16). The lecture, sponsored in honor of National Women’s History Month by the College of Humanities and Social Sciences’ Women’s Caucus, will be held from 3:30-5 p.m. in CHSS Building Room 140. Monday is a 1998 SHSU Service Award recipient. She received her Bachelor of Science degree from The University of Texas at Austin, where the College of Education recognized her as an outstanding alumna. On Tuesday through Thursday (March 17-19), the women’s caucus will host a series of films designed to foster discussion about women's issues embedded in historical, ethnic and cultural contexts, according to assistant professor of sociology Mary Ann Davis. On Tuesday, the caucus will present “Iron Jawed Angels,” starring Hilary Swank, at 6:30 p.m. in CHSS Room 110. Wednesday’s showings will include “Eat Drink Man Woman,” at 3:30 p.m., and “North Country,” starring Charlize Theron, at 6:30 p.m.
Thursday’s presentations include Maya Angelou’s “Down in the Delta,” starring Alfre Woodard, at 3:30 p.m., and “Bread and Roses,” at 6 p.m. Both Wednesday’s and Thursday’s showing’s will be held in CHSS Room 120. For more information on the speaker, call Harman at 936.294.3614, and for more information on the film series, contact Susan Strickland at 936.294.3128 or Davis at 936.294.4083. The Student Advising and Mentoring Center will spotlight two SHSU faculty members during its “Up Close and Personal” and “Grassroots: A Series of Conversations on Leadership in a Diverse Community” presentations on Wednesday (March 18). Political science department assistant professor Rob Bittick will discuss his life for the “Up Close and Personal” lecture at noon in the Farrington Pit. Bittick, who teaches the “American Public Policy” (Pol 285) and two graduate-level courses, earned his bachelor’s and master’s degrees from California State University—Dominguez Hills and his doctorate at Claremont Graduate University. He has been at SHSU since 2005. Howard Henderson, an assistant professor of criminal justice, will also discuss aspects of his life and field questions during the “Grassroots” lecture at 5 p.m. in College of Humanities and Social Sciences Building Concourse Room 90. An SHSU alumnus, Henderson received his bachelor’s degree from Middle Tennessee State University, his master’s degree from Tennessee State University and his doctorate from SHSU. He has worked at SHSU since 2006, teaching in the areas of criminology, community corrections, introduction to criminal justice, juvenile justice, race and crime, and social deviance. Both lectures are free and open to the public. For more information, call the SAM Center at 936.294.4444 or e-mail samcenter@shsu.edu. Students in the PGA professional golf management program will help local golfers with their pitching, chipping, putting and swing on March 20 “fore” their “Free Lesson Friday” at Raven Nest Golf Club. Lessons will be provided from noon to 5 p.m.
At least five students will be on the range at all times, giving lessons for about 15 to 20 minutes, depending on if there is a waiting line or not, according to Ballinger. “We have given lessons on pitching, chipping, putting, and full swing lessons,” he said. “We are happy to help people with whatever aspect of their game they feel needs some help. “People have been coming to us with a particular area they would like to work on,” Ballinger said. Golfers who want assistance are not required to make appointments in order to participate. The March 20 “Free Lesson Friday” is the second held by the program. The first was held March 6. For more information, call the Raven Nest Golf Club at 936.438.8588 or Ballinger at 936.294.4810. The American Democracy Project will tackle the working poor during its “Burning Issues Film Series” showing of “Waging a Living” on Tuesday (March 17) and Wednesday (March 18). The documentary will be played at 3:30 p.m. in Academic Building IV Room 220. Directed by Roger Weisberg, “Waging a Living” looks at the term “working poor” as an oxymoron through its chronicling of the day-to-day battles of four low-wage earners fighting to lift their families out of poverty. “If you work full time, you should not be poor, but more than 30 million Americans—one in four workers—are stuck in jobs that do not pay the basics for a decent life,” according to the movie description on The Internet Movie Datatbase. The “Burning Issues Film Series” was established in 2007 to “contribute to the academic and cultural life here at SHSU by bringing in films that address or relate to critical issues facing the world today,” said John Newbold, ADP co-chair. During the film, participants are also encouraged to discuss the issues that emerge from the movie, according to Tracy Szymczak, the campus VISTA (Volunteers in Service to America) in charge of the series. Those discussions are facilitated during an intermission halfway through the film and also after the film for those who want to stay. “Waging a Living” will also be shown on March 24 at 6 p.m. in AB IV Room 220. For more information, contact Szymczak at tms007@shsu.edu. Registration by classification for the summer and fall semesters will open at 5:30 p.m. on Friday (March 20). Registration begins for honors students on that day, followed by doctoral students, graduates, post baccalaureates, and seniors on March 23-24; juniors on March 25; sophomores on March 26; and freshmen on March 27. Registration will close at 8 a.m. on May 8. Advisement appointments can be made in the Student Advising and Mentoring Center, located in the College of Humanities and Social Sciences Building Room 170, from 7:30 a.m. to 4:30 p.m. each school day, as well as from 5-6:30 p.m. on Mondays and Wednesdays, by calling 936.294.4444. Walk-ins will also be accepted one week prior to and during the registration period only; however, waiting times may be longer for walk-ins. Registration assistance will be available from 8:30 a.m. to 4:30 p.m. in the Registrar' s Office, located on the third floor of the Estill Building. The SHSU School of Music will host three free music events featuring the tuba euphonium ensemble, the steel drum band and a guest cellist beginning Tuesday (March 17). That day, the SHSU Tuba Euphonium Ensemble, as well as other students from the euphonium and tuba studios, will give audiences a preview of their performances for the Southern Regional Tuba-Euphonium Conference March 19-21 at Texas A&M—Corpus Christi. The concert, which will be held at 7:30 p.m. in the Recital Hall, will feature the late School of Music chair Fisher Tull’s “Tubular Octad,” as well as "a wonderful arrangement by euphonium student, Brandon Quam or Eric Whitacre’s beautiful ‘Sleep,’" said, Robert Daniel, adjunct professor of tuba. The SHSU Steel Band will fill the Farrington Pit with traditional Caribbean music, Latin jazz, and various arrangements of current popular music on Wednesday (March 18) at noon. “Everyone is invited to bring a lunch and enjoy the live outdoor music,” said John Lane, assistant professor of percussion. On Thursday (March 19), guest artist Craig Hultgren will play a solo program of recent compositions for the cello at 7:30 p.m. in the Recital Hall. The concert will feature living composers with connections to the state of Louisiana, including works with amplification, audio soundfile playback and a computer score-reading tablet, according to theory and composition faculty member Vincetti Frizzo. Among the pieces that Hultgren will perform is Frizzo’s “Into My Own,” as well as Louisiana State University music professor Dinos Constantinides’ “Four Interludes” and a number of pieces written by Constantindes’ former students. Several of the pieces that will be performed were written specifically for Hultgren, according to Frizzo. For several decades Hultgren has been a proponent for new music, the newly creative arts and the avant-garde. A long-time cellist in the Alabama Symphony, he also plays in Luna Nova, and teaches at the University of Alabama at Birmingham, the Alabama School of Fine Arts and Birmingham-Southern College, where he directs the BSC New Music Ensemble. For more information on either concert, contact the School of Music at 936.294.1360. Junior Patricia Wilken (center) was one of three students awarded a $650 scholarship by the Student Money Management Center for attending Financial Literacy Week events Feb. 23-27. 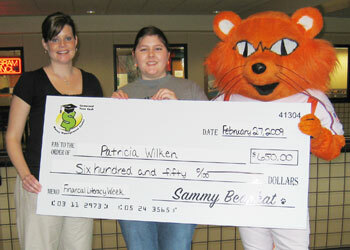 Presenting Wilken her check are Jacki Brossman-Ashorn, SMMC assistant director and Sammy the Bearkat. For three students and three student organizations, Financial Literacy Week paid off. The Student Money Management Center awarded scholarships to junior kinesiology major Stephen Ferguson, junior Spanish major Patricia Wilken and junior international business major Carolyn Hall for their participation in literacy week events. Ferguson and Wilken were chosen from a random drawing to receive $650 scholarships. “These scholarships were provided through the funds generated from the booth fee that vendors were charged for participating in the expo,” said Jacki Brossman-Ashorn, assistant director for the Bearkat OneCard Services and Student Money Management Center offices. Hall, who was also awarded a $650 scholarship, won her prize by attending the Financial Aid and Vendor Expo that was held on Feb. 26. The scholarship was sponsored by Higher One. In addition, the student organizations that had the highest percentage of its total membership in attendance were also awarded prizes. Those include Omega Psi Phi, 1st place prize of $1,000; Omega Delta Phi, 2nd place prize of $750; and Alpha Phi Alpha, 3rd place prize of $500. SHSU senior Kayla Hughes was recently featured in “Lion,” the Lions Club International magazine. In an article entitled “Youth is Served,” Hughes discusses the recently-established SHSU chapter, the difficulties of running a campus chapter and some of the activities in which they have participated. Hughes, an animal science major from Orange, served as the president of a Leo Club when in high school and now serves as the SHSU chapter president. “Even though the chapter is fairly new, they’ve already racked up an impressive list of accomplishments,” the article said. SHSU’s chapter was established in February 2008 and initiated its charter members in March 2008. Among these accomplishments are helping with a fundraiser for Canine Partners for Life, donating to the Hurricane Ike relief, regularly visiting nursing homes, making baskets for holidays and special occasions for the elderly, and doing yard and housework for senior citizens who cannot physically perform the chores. Dedicated to answering “the needs that challenge communities around the world,” Lions Club International is the world’s largest service organization. “Lion” is published in 21 different languages, including English, Spanish, Japanese, French, Swedish, Italian, German, Finnish, Korean, Portuguese, Dutch, Danish, Chinese, Norwegian, Icelandic, Turkish, Greek, Hindi, Polish, Indonesian and Thai. Sam Houston State University, along with several other local entities, will host the 13th Annual HUB/Vendor Show on Tuesday (March 17). Vendor booths for Historically Underutilized Businesses will be set up from 9 a.m. to noon that day at the new Walker County Storm Shelter to showcase products and services available to departments. “This event is an excellent opportunity to meet certified HUB vendors that can meet your purchasing needs while also meeting and supporting the university’s HUB participation goals,” said Bob Chapa, HUB coordinator. All faculty and staff are encouraged to attend. The show is co-sponsored by the SHSU Small Business Development Center, the Texas Department of Criminal Justice, the City of Huntsville and Walker County. The Walker County Storm Shelter is located on Highway 75 North next to the Prison Museum. For more information, call the Purchasing Department at 936.294.1894. The physics department will explore Orion, Gemini, Taurus and other constellations currently visible during “Winter Skies and Moon Dreams” on Monday (March 16). The planetarium series program will be held at 2 p.m. and again at 7 p.m. in the Planetarium, located in Farrington Building Room F102. “Winter Skies and Moon Dreams” also will be shown on March 27 at 7 p.m. In April, the program will change to showcase spring constellations. The Student Advising and Mentoring Center will teach students to “study smart” with its second workshop series beginning on Monday (March 16). The Study Skills Workshop Series is comprised of six one-hour sessions that focus on studying smart, procrastination, time management, reading textbooks and note taking, test taking strategies and stress management. Sessions will be held on a variety of days and times to accommodate student schedules. All sessions will be held in the SAM Center, located in College of Humanities and Social Sciences Building Suite 190. For more information, contact the SAM Center at 936.294.4444 or samcenter@shsu.edu. Bearkat OneCard and Student Money Management Center director Kristy Vienne has been elected to the board of directors for the National Association of Campus Card Users. Vienne will serve one three-year term, with the option to elect to serve an additional three-year term for the board. “I am truly honored by the nomination and election and hope to represent Sam Houston well in this position,” Vienne said. The National Association of Campus Card Users is a nonprofit educational association that works to provide learning and networking opportunities for campus ID card and card industry professionals. The association offers a monthly newsletter (CardTalk), ListServ, Web site, an annual conference, and regional workshops on topics related to campus cards. It was formed in 1993 to provide a responsive, diversified source of campus card related information and services. Richard Henriksen, associate professor of counseling, will debut his book on counseling multi-cultural heritage individuals during the American Counseling Association’s annual national conference on March 19. “Counseling Multiple Heritage Individuals, Couples, and Families,” co-written by Henriksen and Derrick A. Paladino, was published in January by the ACA, “an honor in and of itself,” according to counseling associate professor Daniel Eckstein. During the conference, held March 19-23 in Charlotte, N.C., Henriksen and Paladino will attend the ACA presidential reception, participate in an author book signing and give a presentation. The 275-page book is available for preorder at Amazon.com, at http://www.amazon.com/Counseling-Multiple-Heritage-Individuals-Families/dp/1556202792/ref=sr_1_12?ie=UTF8&s=books&qid=1230950242&sr=8-12. According to Amazon.com, it will be available April 30 to be mailed.